Deep cycle batteries cannot be completely charged from a vehicle’s alternator which only delivers a single voltage, typically 13.8V. This voltage (13.8V) under-charges and reduces the life of the deep cycle battery. The 3 stage charge delivered by the IDC range of chargers inputs a tailored charge specific to the selected battery ensuring increased performance and life of your deep cycle battery. The first stage (bulk) charges the battery faster while the second stage (absorption) ensures the battery is thoroughly charged. The final stage (float) maintains the battery ready for use and can be left connected indefinitely. Choose from either an intelligent and compact dual voltage meter ideal for monitoring twin battery installations often found in 4WD and caravan applications or a smart battery gauge with sophisticated, full colour LCD monitor that accurately displays a battery’s total capacity, overall health and general status. Ideal for camper trailer and caravan interiors. 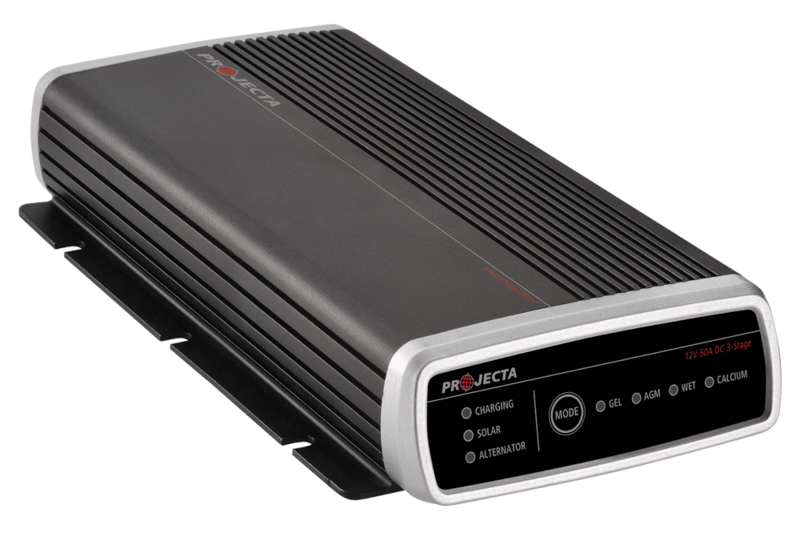 Projecta’s latest heavy-duty battery trays provide the ideal solution when mounting an auxiliary battery into a vehicle’s engine bay. The range has been engineered to fit specific vehicle types meaning the battery trays can be installed without the inconvenience of having to modify the battery tray or parts of the vehicle.